The driveway is found at the back of the house and can fit 4 medium sized cars. To the left of the driveway is a gravelled area and a gate through to a mediterranean style courtyard. The main entrance into The Post House is accessed through French doors from this courtyard. You enter into The Dining Hall, a large, vaulted, high ceilinged and impressive room, formally the village Bakery, with wide, French Oak floor boards. Here is a large dining table with seating for up to 12 guests; there are also a couple of chairs and television. 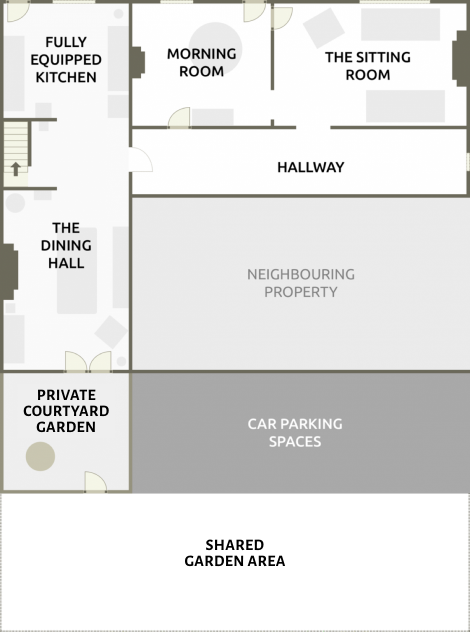 Through an open plan hallway you will find the fully equipped kitchen. A doorway off this hallway takes you into another spacious hallway with a light travertine floor. There is a Door through to The Morning Room, which opens into The Sitting Room. The Sitting Room - a large room with seating for 10 guests on French sofas and a chaise longue. The flag stone floor continues through this room, there is a large open fire and shutters at the bay window. There are 2 staircases in the house. 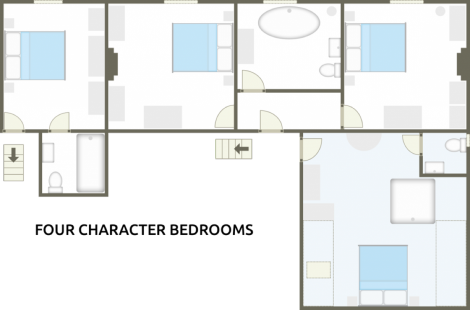 The floor plans are not accurate and are intended to give you an indication of the space & layout of the rooms. All bedrooms have hairdryers, towels, dressing gowns, slippers and luxury toiletries and flat screen televisions. The first staircase is found through a door in the spacious hallway. At the top of the stairs is The Blue Room. This is a pretty bedroom in the eves (tall guests beware of heads!). There is a 4’6” double bed and the possibility to add a further single bed. There is a unique square bath in the room and an ensuite loo and basin. Hanging space under the eaves and a chest of drawers. Next door to The Blue Room, off the landing, are 2 further bedrooms. Both rooms can be made up as either twin beds or a super king size bed. There is the possibility to add a further single bed to one of these rooms. There are built in wardrobes with hanging space in both rooms and shelving and a side table. These rooms share a large bathroom, with a freestanding roll top bath. The 2nd staircase ascends from the smaller hall between the Dining Hall and the Kitchen. Here is the 4th bedroom with French Oak floor boards. There is a small ensuite bathroom with shower over the bath. The bedroom has a cupboard with hanging space, a chest of drawers and bedside tables. Book online or please email or call Karen or John on 01761 241704 or 07767 202295 for more details or to pay by BACs transfer (leave a message if unanswered and we’ll get straight back to you). We also have a Booking Enquiry Form if you prefer.